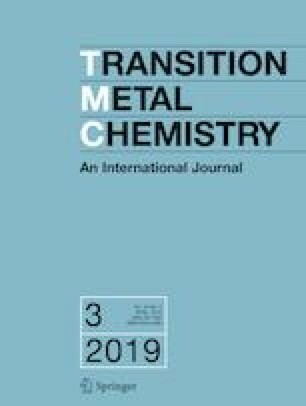 The present work reports the synthesis, spectroscopic and structural characterizations of Fe(III) complexes of types [Fe(L)(H2O)(NCS)] (1), [Fe(L)(1-methylimidazole)2]ClO4 (2) and [(L)Fe(μ-O)Fe(L)]·3H2O·MeOH (3) containing a known planar N2O2-donor salphen Schiff base, H2L (N,N′-bis(3-methoxysalicylidene)phenylene-1,2-diamine). In mononuclear complexes 1 and 2, iron(III) centre adopts a distorted octahedral geometry where planar N2O2-donor L2− ligand forms equatorial plane and varied co-ligands (aqua and thiocyanate in 1 and 1-methylimidazole in 2) occupy the axial sites. The μ-oxo-bridged dinuclear complex 3 is a new solvatomorph of [(μ-O)(Fe(vanophen))2]·2H2O [vanophen = N,N′-bis(3-methoxysalicylidene)phenylene-1,2-diamine] reported by Jana et al. where a marked difference in Fe–O–Fe bond angle is noticed. The electrochemical behaviours of H2L and complexes 1–3 have been examined to ascertain the nature of electron transfer processes. The binding interactions of 1–3 with ct-DNA as well as with Bovine serum albumin (BSA) have been investigated using fluorescence spectroscopy in T10E1 buffer (pH = 7.8). All the complexes show good binding propensity with ct-DNA probably via partial intercalation mode. Furthermore, the complexes quench the intrinsic fluorescence of BSA by a static quenching mechanism. The online version of this article ( https://doi.org/10.1007/s11243-019-00322-6) contains supplementary material, which is available to authorized users. AKS acknowledges Science and Engineering Research Board for financial support (grant ref. : EMR/2016/001452) and DST-INSPIRE research grant (IFA-13, CH-97). VNR is grateful to Central University of Rajasthan for University fellowship. SJ thanks DST-INSPIRE for SRF; MR is thankful to DST-SERB for fellowship; TAK is grateful to the UGC for SRF; KB is grateful to SERB for NPDF (PDF/2017/000929) fellowships. Authors acknowledge the instrumental facilities at Department of Chemistry, Central University of Rajasthan supported by DST-FIST (ref. no. SR/FST/CSI-257/2014 (C)). We are thankful to Department of Chemistry, IIT, Jodhpur and USIC, The University of Burdwan for X-ray crystallographic facilities. Paper is dedicated to the memories of Dr. Sunil G. Naik. The authors also acknowledge the Reviewers for their valuable suggestions in the revision stage.